Science lets us know more about the oceans. In the past I think we looked at this as an in? nite re- source, but science has told us it is not. A The oceans are ? nite. year after the Japanese tsunami we were seeing marine debris wash up on U.S. and Canadian shorelines; it’s not that big of a world. 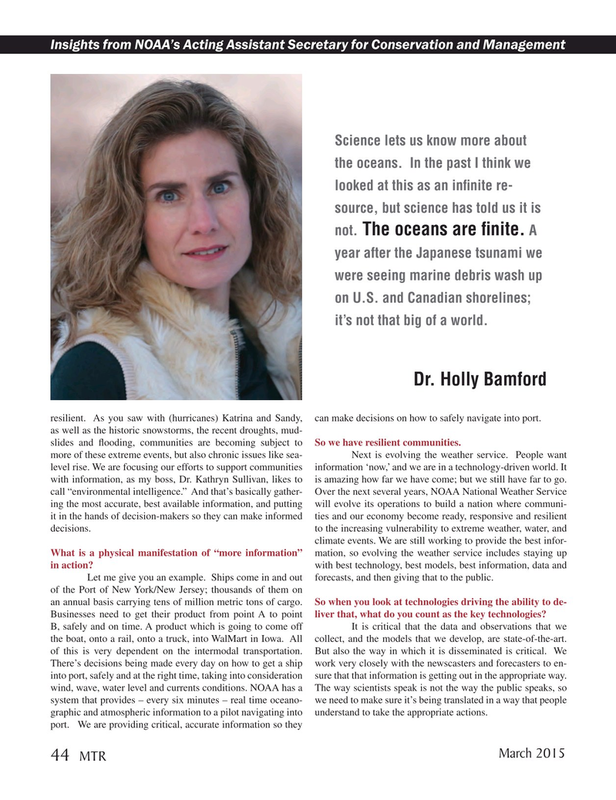 Dr. Holly Bamford resilient. As you saw with (hurricanes) Katrina and Sandy, can make decisions on how to safely navigate into port. as well as the historic snowstorms, the recent droughts, mud- slides and ? ooding, communities are becoming subject to So we have resilient communities. Businesses need to get their product from point A to point liver that, what do you count as the key technologies?